Former Coal CEO Blankenship Found Guilty Of Conspiracy In Mine Disaster Case : The Two-Way Former Massey Energy CEO Don Blankenship was acquitted of two other counts, meaning he'll face far less than the potential 30-year prison sentence prosecutors had sought. Federal prosecutors said Don Blankenship operated Massey Energy as a "lawless enterprise." He's seen here leaving a federal courthouse in Charleston, W.Va., on Nov. 17, when the jury began deliberations. More than two weeks after it received the case, the jury in the trial of former Massey Energy CEO Don Blankenship has delivered a mixed verdict, finding Blankenship guilty of "conspiring to violate federal mine safety standards, a misdemeanor charge that carries up to a year of jail time," as West Virginia Public Broadcasting reports. Blankenship was acquitted of two counts of making false statements, meaning he'll now face far less than the potential 30-year prison term prosecutors had sought over the 2010 explosion at the Upper Big Branch mine, which killed 29 miners. News of the verdict came around midday Thursday — days after the jurors said for the second time that they were deadlocked. Responding to the jury's notice earlier this week, U.S. District Judge Irene Berger issued an Allen charge, urging jurors to consider both the majority and minority opinions — and to consider a partial verdict, as well. An Allen charge refers to the instructions given by a judge when a case is at risk of having a hung jury. In this case, the jury's deliberations spanned a five-day break for the Thanksgiving holiday. The panel began its deliberations on the afternoon of Nov. 17 — and the case seemed headed toward a mistrial after just one full day of deliberations, when the jurors sent a note to the judge on Nov. 19 saying they couldn't agree on a verdict and asking how long they should continue to try. The defense moved for a mistrial at that point, but Berger rejected the motion. A similar motion was put forth Friday afternoon, which Berger also rejected. The authorities say Blankenship, 65, closely managed the Upper Big Branch mine, which was linked to hundreds of safety violations. Blankenship was charged with conspiracy to violate federal mine safety standards and to defraud the U.S. government for his company's profit and his personal gain. When a federal grand jury indicted him one year ago, the charges also included "lying to the Securities and Exchange Commission about the company's safety practices and stock purchases," as NPR's Howard Berkes reported. "Local U.S. Attorney Booth Goodwin called ex-Massey Energy CEO Don Blankenship an outlaw in his closing remarks, telling jurors he operated one of the nation's largest coal producers as a 'lawless enterprise.' The prosecution's case attempted to depict Blankenship as a micromanager who pushed production over safety. "The defense argued the government has produced no direct proof Blankenship was involved in any conspiracy, only reams of paper, referring to the thousands of pages of evidence the prosecution has entered in the case." 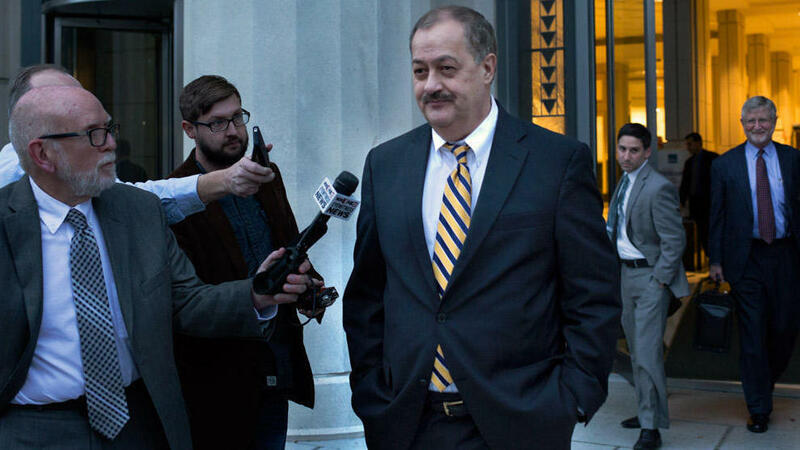 The case went to the jury more quickly than anticipated, after "Blankenship's defense team rested its case without calling a single witness," as our colleagues at West Virginia Public Broadcasting report in a summary of the trial. In contrast, the prosecution called 27 witnesses over more than three weeks of testimony. Blankenship was indicted months after former Massey Energy mine superintendent Gary May was sentenced to 21 months in prison and ordered to pay a $20,000 fine, in a plea deal that saw May admit to "ordering a company electrician to disable a methane monitor on a mining machine so it could continue to cut coal without automatic shutdowns." In September 2013, another former Massey executive, David Hughart, was sentenced to 42 months in prison in a separate plea agreement in which he "admitted to being part of a corporate conspiracy to evade surprise mine safety inspections by giving advance warning to miners underground."